Global Payment Processing: Why Do So Many Payments Fail? Today’s eCommerce businesses must have the ability to sell to shoppers around the globe. According to PWC’s Total Retail 2016 report, 65% of consumers would purchase globally rather than locally if the price is right, and that number is likely to increase if the global eCommerce market continues to flourish as expected. Would it surprise you to know that your ability to capitalize on this opportunity depends in part on your global payment processor? 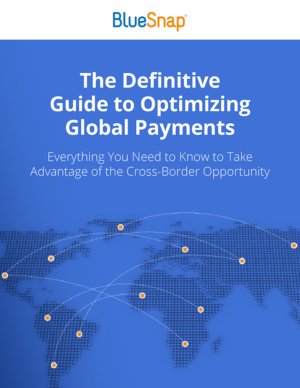 That’s right—global payments processing can help you make more international sales, as long as it’s done right. And it isn’t always easy to tell what’s going on behind the scenes of a processing engine, which makes it harder to compare your options. The information below explains how global payment processing works, and the different ways it is handled by various global payment processors. Want more information on how your business can thrive globally? Download our free ebook for ways to eliminate checkout friction for international customers, and get six essential metrics to measure cross-border success. The shopper submits their order on the merchant site. The gateway captures the transaction request from the merchant and routes it to an acquiring bank. The acquiring bank runs its fraud checks against the transaction and, if approved, routes the transaction to the issuing bank. The issuing bank either approves or declines the transaction and sends its response back to the payment gateway via the acquiring bank. The payment gateway presents an answer to the shopper. Seems simple enough, right? But complexities with global transactions arise in the first step, because not all global payment processors handle acquiring banks and routing the same way. What’s so complex about processing global transactions? Some global payment processors partner with only one acquiring bank worldwide. A bank with a single acquiring partner located in the U.S., for example, has to route payments from shoppers everywhere through that U.S. acquirer. Transactions that originate outside the U.S. will be seen as cross-border payments and are more likely to be declined by the issuer. Some payment processors have multiple acquiring partners in different parts of the world. BlueSnap, for example, has 30+ global acquiring partners in five different regions around the world—Latin America, U.S., Canada, Australia and Europe & Israel. So if a transaction doesn’t get approved, it goes to a second bank in an effort to improve your payment conversion success rate. How do global payments get routed to the right acquiring bank? For payment processors that have a single acquiring partner in the same part of the world as the shopper, the foreign transaction will most likely be forwarded to that acquiring bank. Payment processors with multiple acquiring banks in different parts of the world need routing “rules” that dictate where transactions are sent. BlueSnap, for example, uses intelligent payment routing to send global transactions to the bank most likely to approve them. Card type—Some acquiring banks don’t accept all types of credit cards; if a shopper is using a less common card, like Diners Club, we’ll send it to a bank that regularly handles Diners Club card payments. Merchant category codes (MCCs)—This 4-digit number identifies what type of business the merchant is in, like a SAAS merchant or an online clothing store; transactions are more likely to go to banks that regularly approve similar types of transactions. Currency—Not every acquirer will process all of our different currency codes (our merchants can sell in over 100 currencies! ), so we’ll determine which currencies are converting better at which banks and send it to the one most likely to approve. Geography of the shopper—If you are boarded with an acquiring bank in the same country as the shopper, your transaction is likely to be sent to a bank in that region, with all the above rules also applying. If you have only a U.S. legal entity, we’ll use the above rules to look for the most appropriate bank in the U.S.
Look for a payment processor that gives you global coverage in a single account. Using only a single BlueSnap account, merchants can connect with many different acquirers via one integration with us because we handle it all in our back end. We keep it simple for you: one consolidated set of reports and error codes, one deposit for all your payment processing, and no gateway traffic management on your end. Have more questions about global payment processing? We’d like to help! Ask us anything—just click here to get a conversation started. Next Story Multiple Payment Gateways: Should You Consolidate To One?